Are you also in love with these unforgettable Arcade classics, where the only goal is to vanquish all opponents to reach the next stage? 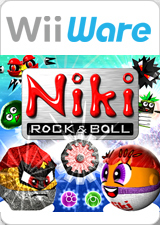 Niki – Rock 'n' Ball is a new interpretation of these games with a completely innovative and unique gaming mechanism. The graph below charts the compatibility with Niki – Rock 'n' Ball since Dolphin's 2.0 release, listing revisions only where a compatibility change occurred. This page was last edited on 22 January 2018, at 02:01.